Those who know the true history behind the name "Banton Construction" will develop a strong understanding of the vision, drive and determination that truly makes Banton what it is today. A lifelong resident of Connecticut, Frank Pullano grew up on Banton Street in North Haven. 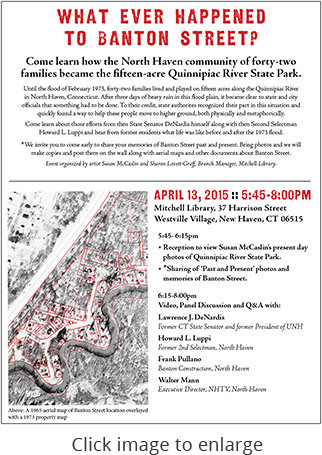 In the early days, Banton Street’s residents experienced frequent flooding of the Quinnipiac River. By 1973 the situation had become increasingly dangerous, forcing the entire community to permanently evacuate their homes. Despite the challenges encountered, Banton Street’s residents took great pride in their neighborhood, remaining a closely knit community through the years and to this day. In 1979; Frank Pullano named his fledgling construction company as a tribute to the neighborhood. In 2019, Banton Construction will celebrate its 40th year in business. "Nothing in the world can take the place of persistence. Talent will not: nothing is more common than unsuccessful men with talent. Genius will not: unrewarded genius is almost a proverb. Education will not: the world is full of educated derelicts. Persistence and determination alone are omnipotent. The slogan 'press on' has solved and always will solve the problems of the human race."